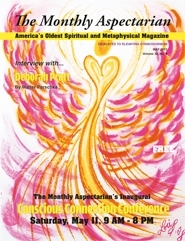 We’re thrilled to tell you that our Positive Attitude Angelic Message Portrait™ was just featured on the cover of The Monthly Aspectarian Magazine, the foremost voice in the Midwest for those seeking enhancement of body, mind, and spirit. We highly encourage you to click on the above link and check out “this must read” magazine! The Angels tell us the surest way to achieving and maintaining a healthy Positive Attitude is to let go of that which is no longer serving us. We need to go deep within ourselves and do an emotional house cleaning. Once that is accomplished we are free and clear to follow our hearts. For it is in the following of our heart’s desires that we will find true joy. When we open ourselves to that divinely inspired passion we will know we have found not just the right path, but our path. 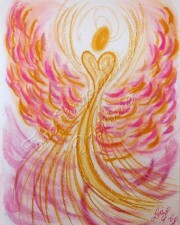 It is then, the angels remind us, that we are to not get caught up in the details of how this will be accomplished. For ours is not to determine how . . . ours is simply to allow. 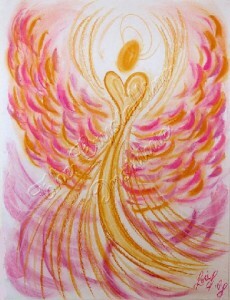 Let this Positive Attitude Angelic Message Portrait help you to find and follow the passion that burns within you. This beautiful angelic artwork, was created by Visionary Artist and Angel Communicator, Lori Daniel Falk, to encourage us to go deep within ourselves and do an emotional house cleaning and let go of that which is no longer serving us.